Brand new on the market for the 2016 season, this totally renovated apartment is waiting for the first reviews! Welcome to Cala Bhrèagha, our very comfortable luxury holiday apartment at the front of the iconic Tobermory harbour. Cala Bhrèahga is Gaelic meaning beautiful harbour (pronounced cala vrèagha) and the apartment forms part of the original fishermens cottages that were built in the 1850's with stunning views out across the harbour to the islands and the mainland beyond. Cala Bhrèagha is the ideal base for you to explore the fantastic Isle of Mull. The apartment offers three good sized bedrooms sleeping up to 6 guests . 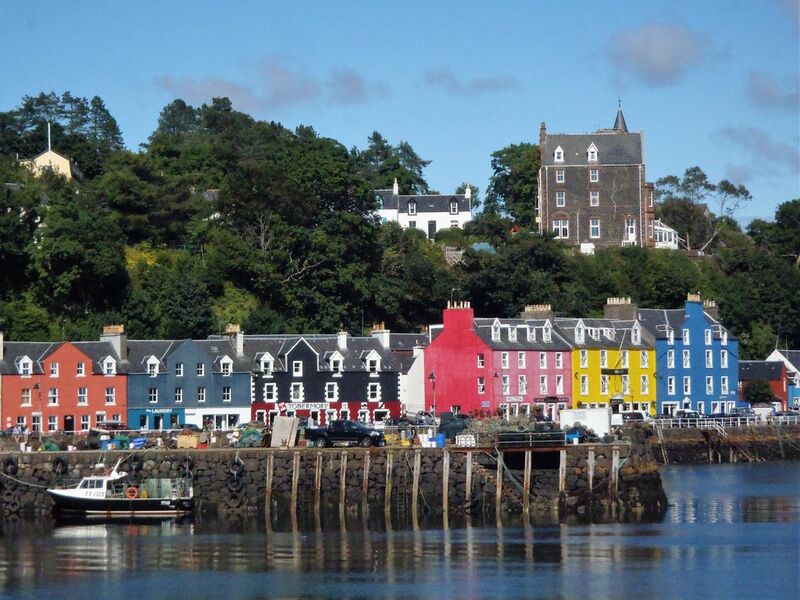 Being in the heart of Tobermory you have the most convenient access to all that the capital of Mull offers with a good selection of restaurants (sea food always features), pubs and shops on your door step. There's even a distillery 300m from the apartment where you can sample and buy their wares! The lounge and two of the bedrooms face the harbour so you will never miss anything that's going on may even catch sight of dolphins that have been seen right in the harbour. The apartment is on the 1st floor accessed through a close (Scottish term for alleyway) and up a stone stair at the rear. Fully renovated to provide a very comfortable stay with all the modern facilities that you would expect. One bath sheet and hand towel per guest for one week. Electric oven with induction electric hob, microwave, fridge, dishwasher, kettle, toaster, dining table for 6, washing machine and freezer are in a separate utility room. wheelchairs would not be possible due to stone stair access to the first floor. We would come back here very happily, Mull is a fantastic destination and Tobermory is a superb and very welcoming centre. Very clean, comfortable apartment in the heart of Tobermory. A great base to explore the island. Excellent facilities on the doorstep from local eateries to craft shops to suit all tastes. Scenery, wildlife etc exceptional. Ideally located on the waterfront and very clean and well equipped apartment as others said. It is very accurately described, unlike any property we've stayed in before. Also, the instructions for entry on arrival were very clear. Heating was available even in September though the bathrooms tended to be a bit cold. Apart from the weather, the only downside for us was that the smaller rear bedroom has the ensuite. The apartment is finished to a high standard and provides all the modern conveniences needed. The owners, who were great to deal with, have thoughtfully provided lots of booklets, pamplets etc. concerning local attractions. With a beautiful view over the harbour, Cala Bhreagha is right in the thick of the centre of town. You are literally steps away from the grocery store, the ironmongers (a hardware store that also sells wine and spirits), the chemist, a chocolatier's shop, a fantastic bakery and a whole raft of restaurants! Be aware that this central location means that you will very occasionally hear traffic or people heading home from the pub now and there are streetlights outside the window. The windows are all dressed with lined curtains which help greatly. There is one bedroom at the back of the apartment that is very quiet. There's lots to do and see in Tobermory and certainly on the Isle of Mull. The Visitor Information Centre there can help you book any number of tours on land or water and provide you with lots of brochures and maps. We are glad we visited Tobermory and stayed at Cala Bhreagha. The Cala Bhreagha is a very nice apartment. Very clean newly refurbished. It's in an old building and the floors creak. It is well appointed and is packed with facilities. We had a couple of small problems during our visit , a blocked shower trap and an overflowing exterior bin, left unemptied. Although reported to the owner, nothing was done. I cleared the rubbish and unblocked a shower trap. The main area of let down for me, was the entrance to the apartment, through a doorway off the seafront, and down an alley, up past dustbins and up some steps. Didn't find this appealing. But the apartment was very nice. Mull though, was fantastic. A tad expensive, as you are a captive audience. Apartment was spotlessly clean, beds very comfortable, and kitchen was very well equipped. Excellent showers. The view from the window is amazing, and the apartment is perfectly placed at a 2 minute stroll from an excellent bakery. There is a Co op just along the harbour for essential food stuff, loads of lovely shops, so we alternated between eating out and cooking in at the apartment. Just go to Mull, because you will fall in love with it, and go to this apartment because it is the perfect base from which to explore the island. You can walk round the harbour to go on a boat trip, or 30 miles away is the perfect beach at Calgary. We didn't scratch the surface in a week, and will be back. Thanks Emma for the valuable feedback. We are glad you all enjoyed your stay and hope to have you back again sometime soon.